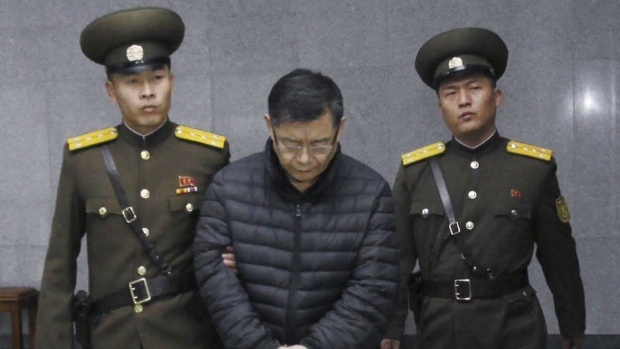 Canadian officials say they're "dismayed" by the life sentence handed down to an Ontario pastor who was found guilty by a North Korean court of crimes against the state. Rev. Hyeon Soo Lim, who pastors the Light Korean Presbyterian Church in Toronto, was given the sentence after a 90-minute trial before the country's Supreme Court on Wednesday. "Canada is dismayed at the unduly harsh sentence given to Mr. Lim by a North Korean court, particularly given his age and fragile health," Francois Lasalle, acting director of Global Affairs Canada, said in a statement to CTV News on Wednesday. Lim travelled to North Korea in January as part of a humanitarian mission and he has been in detention in the communist country since February. His family said Lim, who's in his early 60s, has made more than 100 trips to North Korea since 1997. "Despite repeated requests, Canadian officials have not been able to meet with him to verify his health and well-being," Lasalle said. Officials said the first opportunity they had to see Lim since his arrest was during his trial. LaSalle said North Korea violated the Vienna Convention on Consular Relations, which safeguards the right of states have consular access to their citizens. "Like Mr. Lim's family and friends, the Government of Canada remains concerned for his rights and well-being and wishes to see him return to Canada,” Lasalle said. His family has said Lim travels to North Korean as part of a regular humanitarian mission, where he supports a nursing home, a nursery and an orphanage. Lim's charges included harming the dignity of the supreme leadership, trying to use religion to destroy the North Korean system, disseminating negative propaganda about the country to Koreans overseas, helping American and South Korean authorities lure and abduct North Korean citizens, and helping defectors from the North. In July, Lim appeared at a news conference organized by North Korean authorities in Pyongyang and admitted to plotting to overthrow the North Korean state. Other foreigners detained in North Korea and later released have said they were coerced into making similar statements and confessing guilt during their detention.